The photo above is just one of many beautiful photos taken by Chris Tennant, an Oregon photographer. Chris has had photography opportunities in Oregon, Switzerland, France and New York in 2014. 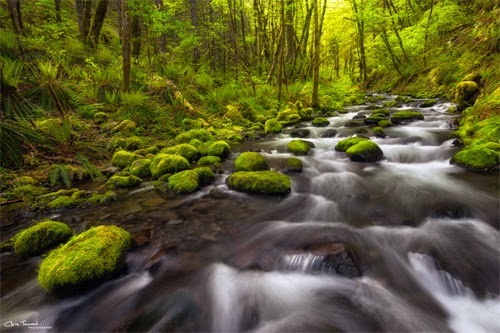 Of all the photo's Chris Tennant has taken throughout the year, 4 of his top ten 2014 photos were taken in the Columbia River Gorge. Please contact Chris Tennant Photography if you are interested in purchasing a piece of his work. Read about Chris Tennants photography experience for 2014 below. ‘Tis the time of year for “Best of” lists. I thought I’d contribute my own in the form of my favorite 10 photographs from 2014. My photography can best be described as “opportunistic”. Often my camera sits in its bag for months at a time. But I usually am able to get out for a dedicated spring and fall photography trip. This spring I thoroughly enjoyed exploring many parts of Oregon; from the rugged coast, to verdant waterfalls and expansive fields of wildflowers. It was an amazing trip and one I hope to repeat in the future. In late summer I had the opportunity to travel to Switzerland and France for a work-related conference and managed to fit some photography in. My photographic year concluded with my annual trip to the Adirondacks in New York State to enjoy the fall foliage.